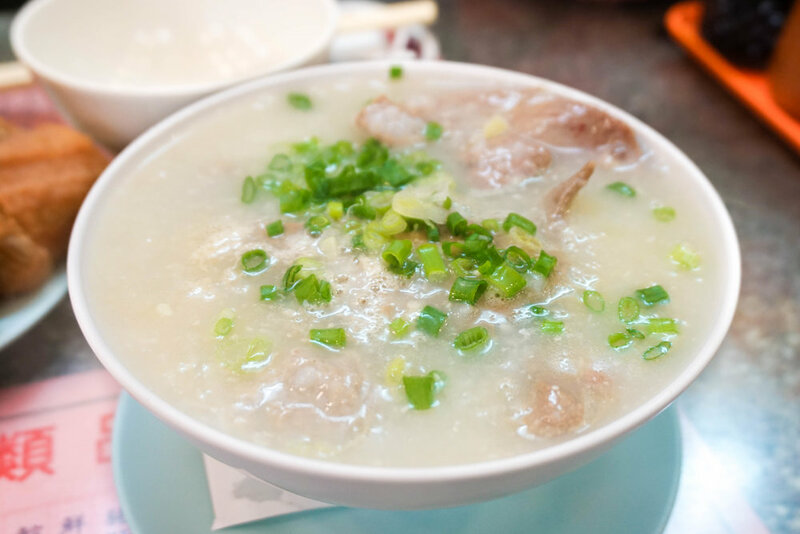 Congee, another local breakfast you must try in Hong Kong. Congee is soul food, even a small sip of fine-boiled rice gruel can bring warm your body up and joy to weary spirit. Law Fu Kee is a small eatery famous for their congee, it currently have 3 branches mainly in central. IThe master chef has been preparing congee from 3 am, for over 50 years. It was also part of the prestigious Michelin Guide Asia and Macau several years ago. The one we went is very easy to find it on the main street, just opposite to Tai Cheong Bakery. Small and simple kitchen. Their menu is presented on each table. The food they serve here is pretty simple, congee with different toppings and they also have some noodle dishes and wontons. As soon as we placed the orders, the waitress asked if we wanna Youtiao. How can a bowl of congee without its perfect partner the youtiao 油條(fried bread stick)? We replied 'yes' without any secondary thinking.The pieces are huge, looks suitably crispy and doughy - perfect for dipping into congee. The right way to have Cantonese congee is to have the congee itself separately from the toppings. Get some toppings and dip them with soy sauce and ginger if you want, so that the flavor becomes stronger. After that you can just have your congee plainly without the toppings! But it really depends if you want to follow the local to have congee in this way. Comes with 6 medium size shrimp wontons with a little portion of pork in simple,and a very smooth skin. Soup base is clean but delicious. The shrimp was really fresh and bouncy ! Fuel up for the whole morning. 140 Des Voeux Road Central, Hong Kong. Tel: +852 2541 3080 144 Queen's Road Central, Hong Kong.